That part of the military is called "US Forces Korea". Think of it as United States Armed Forces in Korea. Their web site is down: Seems pretty straight foward. N Korean hackers brought the system down. Fixing to get nasty. Yeah no kidding Eftury... 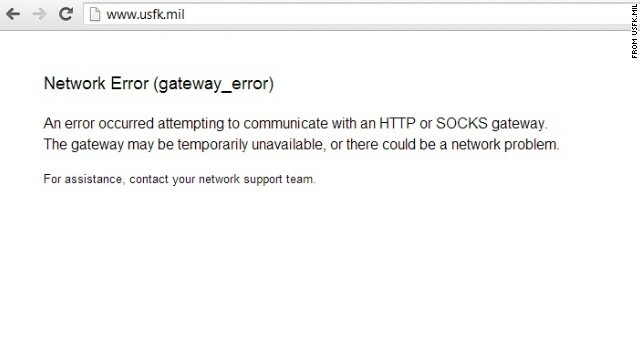 The headline "US Forces Korea Website Down" implies the USA hacked a Korean website not that the website was owned by the US and an outside force hacked or damaged it. There is a complete disconnect between the story and the headline. Not to mention the story as it is right now doesn't make sense. It's so back and forth to the point it would have had the same conclusion had we not even known about it. Having to rebuild from scratch proves they don't have backups.